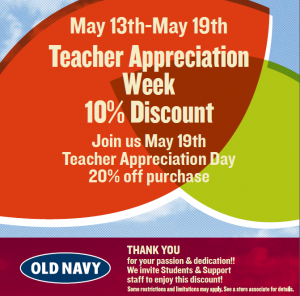 Teacher Appreciation Discount at Old Navy this Week! This week, May 13th-19th, all teachers can head to Old Navy to get 10% off their total purchase.� Just show your Teacher ID card at the register. And, if you wait and go shopping on actual Teacher Appreciation Day, May 19th, you will get 20% off your total purchase! Wasn’t Teacher Appreciation Week last week? Is 20% off on the 19th only for the teachers or is it for everyone?!!! Teachers only. You have to show your teacher ID.